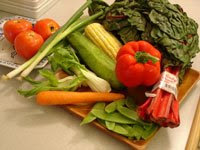 From Martha Stewart (Everyday Food magazine and latest cookbook, Lessons & Recipes for the Home Cook) to Barefoot Contessa (new cookbook, Back to Basics) to Tom Colicchio (watch funny Diet Coke commercial on blog, Eatmedaily), many celebrity gourmet chefs are promoting simple cooking. Why? Because they realize people cannot cook gourmet on a daily basis. We are talking about putting dinner on the table EVERYDAY and that’s what I focus on. I’ve made wok cooking accessible to anyone, it’s not about gourmet/foodie/frou frou or tons of gadgets like Pampered Chef that make your head spin. Many of my friends are chefs and there are gazillion cookbooks with beautiful photos of sculpted dishes with tons of lovely recipes like Jaden Hair’s. Jaden is a food writer, photographer, TV personality and popular Twitterer. Her food blog, Steamykitchen needs no introduction. 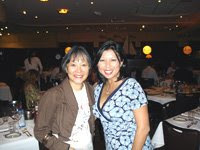 She was in Miami overnight, so I was lucky to get this photo of us at Oceanaire Restaurant in Brickell Village. I got to meet her whole family including her adorable boys, hubby included. Since then, Jaden’s had her first Steamy Kitchen Cookbook published, congratulations. Oh, she also took all her own amazing food shots!! Sassy, humorous, strong minded but always have time to give advice, so when Jaden called me to talk about my Wok Star Kit, I was very honored. 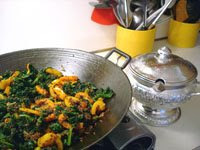 Well, I didn’t realize she was going to include me in her cookbook (p.16 want to make it easy for you, ha) by name and list me as a resource (p.156) for preseasoned cast iron woks!!! She discovered my portable gas stove was more powerful than her regular gas stove! Having Jaden endorse my Kit and stove is huge, I’m doubly honored. 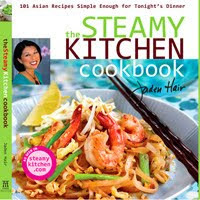 Jaden Hair’s Steamy Kitchen Cookbook available at Barnes and Noble or Amazon. 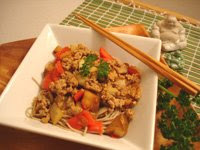 It has all those wonderful recipes of simple Asian dishes that are easy to make that you all keep asking for. And now you have my NO-RECIPE technique down, you can adapt it to any of her recipes. When she comes to Miami for her book signing, I’ll be sure to let you know cause I want mine signed. Now, run out and get her book! What I offer are solutions to many modern day issues, so I came up with a simple recipe-free technique to cooking and show how EASY it is for anyone to be a Wok Star! It’s all about changing your mindset and repurposing your time, so why not make it FUN and TASTY so you’ll look forward to it instead of dreading it? Tom Colicchio is my favorite chef because he is down to earth, has great values and doesn’t have an “attitude”. I told him as much when we had our photo taken together. He laughed and said, “I try,” (my husband’s favorite phrase.) By “attitude”, I mean chefs tend to use gourmet ingredients that us mere mortals cannot afford, find or have time to figure out what to do with. During the cooking demo, he stressed we should not be told what we should or should not eat by someone in a “white coat”. We should eat what we like and how we like it (what a Wok Star is all about!) He also mentioned to leave the food tossing in pans for TV and not focus on recipes. It was music to my ears when I heard him say to use just a few fresh ingredients and good seasonings. I’m a big fan of Mark Bittman, especially when he responded, “actually very smart and good idea” to my solution for electric stove owners. My suggestion is to use a portable butane gas stove ontop of their electric stove for wok cooking. It’s how Asians cook at home and what I do in my cooking classes. It’s like an “AHA” moment when people see this simple solution. I’ve posted several comments on two blogs recently. One is about “Chinese Cooking from Cookbooks” by guest blogger, Edward Schneider about Chinese cooking: “I tend to overdo things — too many ingredients, too many flavors, too much of this aromatic or that…” Read my comment #9. Another comment #8 was a funny story about Ralph (my hubby) who loves my shrimp in their shells dish. I encourage you to post your comments and share your trials and tribulations. Your take on Tom Colicchio and Mark Bittman?